Choose the wholesale purchase of these fantastic divider screens, which not only offer practical use, but really add to the decor of any interior. Available in different styles, and featuring a range of beautiful patterns, your customers will be delighted with how affordable these items are. Browse our selection and place your order today. Colourful canvas or lovely louvred wood? Take your pick of decorative room dividers and screens from our portable and attractive range. 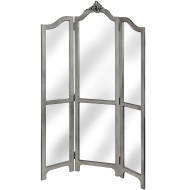 Browse our collection of wholesale room divider screens today. Login in to your account to view our amazing trade prices and order today using our secure process.